JTree salve is an organic, unscented, skin-healer that is effective in treating dry, chapped skin, chafing, abrasions, scrapes and cuts. 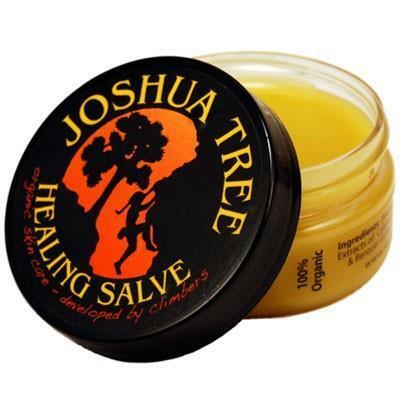 Created using a blend of essential oils, freshly extracted from the finest organic herbs, JTree Salve moisturizes and promotes healing without softening calluses that the body produces for protection. Excellent for healing tattoos and dry skin. They say beauty is only skin deep, so better keep your outer layer looking out of this world. This product will have your skin feeling soft and supple once more after exposing yourself to the harsh elements out on the hill. My buddy Bill up in Buffalo can't get enough of this stuff. Dry chapped skin? No match for this product. All natural and organic you don't have to worry about using it on your kids or - in my case - pets (my dog - check with your vet!!!) it also smells great! Use at night to heal chapped hands. Can be used on feet and elbows too. An organic product which is a great healing salve for chapped skin. love that it's organic and I can use it on my kids. great for winter dry lips and skin!